Zainab and Rishi: A beautiful Indian-Pakistani wedding in Los Cabos! One reason we love working with brides here in Cabo is each destination wedding is unique and special, with couples traveling from all over the world to experience the beauty and hospitality of Los Cabos. 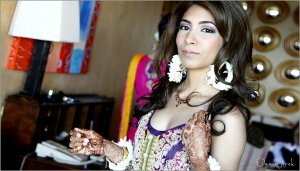 We feel privileged to be able to serve bridal parties of every culture and ethnicity, and this can be a fun way to explore our talents as hair and make-up artists. In this multicultural Indian-Pakistani wedding with Zainab and Rishi, we were thrilled to be a part of the bride’s vibrant make-up, hair and wedding day event design. 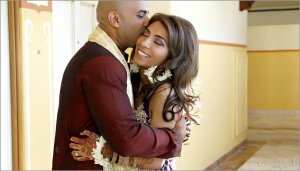 A traditional Indian wedding can last for days and is rich with customs and rituals, but modern brides such as Zainab often find just the right blend of tradition and fun with a destination wedding in Cabo San Lucas. The Sangeet night is a customary evening of dancing and food the night before the wedding. For this long night of festivities, we styled the bride’s hair in a down-do with loose curls. Her eye make-up was done with rich hues of purple and pink to match the deep purple Salwar suit she wore. The Sangeet was held at the Hilton Los Cabos. For the wedding day at Sunset Da Mona Lisa, we styled the bride’s hair in a half up-do style and incorporated her jeweled Teeka (customary headpiece). Her make-up was very traditional, with striking eyeliner and bright gold and green shadow. 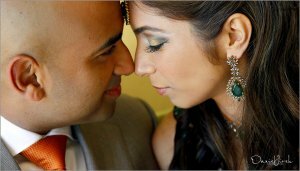 The dramatic make-up really accented the gorgeous green and gold jewelry she wore with her Indian wedding dress (Lengha). The women in her family did the bride’s intricate Henna tattoos in a traditional ceremony. Of course we welcome any opportunity to design the wedding décor for a happy couple through our sister company, Linens, Things and More. We were very pleased to do the elegant gold and white wedding-day décor for this unforgettable celebration. This entry was posted in Blog and tagged Cabo event design, Cabo wedding design, Hilton Los Cabos, Los Cabos Indian Pakistani wedding, Los Cabos wedding, Vivid Occasions wedding planner, Wedding hair and make-up Cabo, Wedding Sunset Da Monalisa. A beautiful African-American wedding hair and make-up in Cabo!